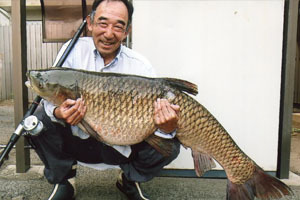 Japanese angler Mitsuru Ichikawa potentially set the new men's 3 kg (6 lb) line class world record for grass carp (Ctenopharyngodon idella) with this impressive 24.40-kilogram (53-pound, 12-ounce) fish that he caught and released on August 19, 2018 while fishing in Motoarakawa, Japan. Ichikawa needed nearly an hour to land the fish after it ate the leaf he was using for bait! If approved, the catch will replace the existing world record of 24.15 kilograms (53 pounds, 4 ounces). 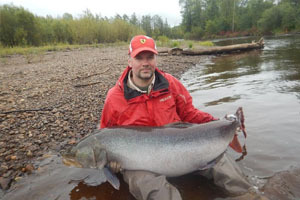 Russian angler Gleb Varzin potentially set the new All-Tackle Length world record for taimen (Hucho taimen) with this massive 140-centimeter fish that he caught and released while fishing Russia's Tugar River on September 6, 2018. The current world record stands at 132 centimeters. 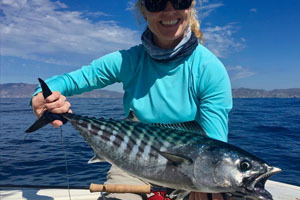 Angler Kesley Gallagher caught this 3.17-kilogram (7-pound) Pacific bonito (Sarda chiliensis) on September 30, 2018 while fly fishing off Catalina Island, California. Gallagher needed 10 minutes to land the fish and if approved, the catch will become the new women's 6 kg (12 lb) tippet class world record, which currently stands at 2.75 kilograms (6 pounds, 1 ounce). 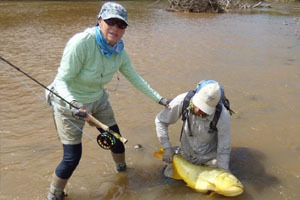 Angler Dotty Ballantyne potentially added another world record catch to her impressive angling resume with this 10.43-kilogram (23-pound) dorado (Salminus maxillosus) that she caught and released on October 5, 2018 while fishing out of Bolivia's Puma Lodge. Ballantyne needed approximately 30 minutes to subdue the dorado after it hit the black baitfish pattern fly she was casting. If approved, the catch will become the new women's 4 kg (8 lb) tippet class world record, which currently stands at 2.13 kilograms (4 pounds, 11 ounces).